Norway, Australia and the United States lead the rankings of 187 countries and territories in the latest Human Development Index (HDI), while conflict-torn Democratic Republic of the Congo and drought-stricken Niger have the lowest scores in the HDI’s measurement of national achievement in health, education and income, published today in the United Nations Development Programme’s (UNDP) 2013 Human Development Report. Yet Niger and the Democratic Republic of the Congo, despite their continuing development challenges, are among the countries that made the greatest strides in HDI improvement since 2000, the Report shows. The new HDI figures show consistent human development improvement in most countries. Fourteen countries recorded impressive HDI gains of more than 2 percent annually since 2000—in order of improvement, they are: Afghanistan, Sierra Leone, Ethiopia, Rwanda, Angola, Timor-Leste, Myanmar, Tanzania, Liberia, Burundi, Mali, Mozambique, Democratic Republic of the Congo, and Niger. Most are low-HDI African countries, with many emerging from long periods of armed conflict. Yet all have made significant recent progress in school attendance, life expectancy and per capita income growth, the data shows. Most countries in higher HDI brackets also recorded steady HDI gains since 2000, though at lower levels of absolute HDI improvement than the highest achievers in the low-HDI grouping. countries in the HDI; Algeria, Kazakhstan, Iran, Venezuela and Cuba were the top five HDI improvers in the High Human Development countries; and Timor-Leste, Cambodia, Ghana, Lao People’s Democratic Republic and Mongolia were the HDI growth leaders in the Medium Human Development grouping. The overall trend globally is toward continual human development improvement. Indeed, no country for which complete data was available has a lower HDI value now than it had in 2000. When the HDI is adjusted for internal inequalities in health, education and income, some of the wealthiest nations fall sharply in the rankings: the United States falls from #3 to #16 in the inequality-adjusted HDI, and South Korea descends from #12 to #28. Sweden, by contrast, rises from #7 to #4 when domestic HDI inequalities are taken into account. “National averages hide large variations in human experience, and wide disparities remain within countries of both the North and the South,” the Report notes, citing the case of the United States, with an HDI value of 0.94 overall, but an average of 0.75 for Latino residents and 0.70 for African-Americans. “Similar ethnic disparities in HDI achievement in very high HDI countries can be seen in the Roma populations of southern Europe,” the Report says. The new HDI rankings introduce the concept of the statistical tie for the first time since the HDI was introduced in the first Human Development Report in 1990, for countries with HDI values that are identical to at least three decimal points. Ireland and Sweden, each with an HDI value of 0.916, are both ranked seventh in the new HDI, for example, though the two countries’ HDI values diverge when calculated to four or more decimal points. 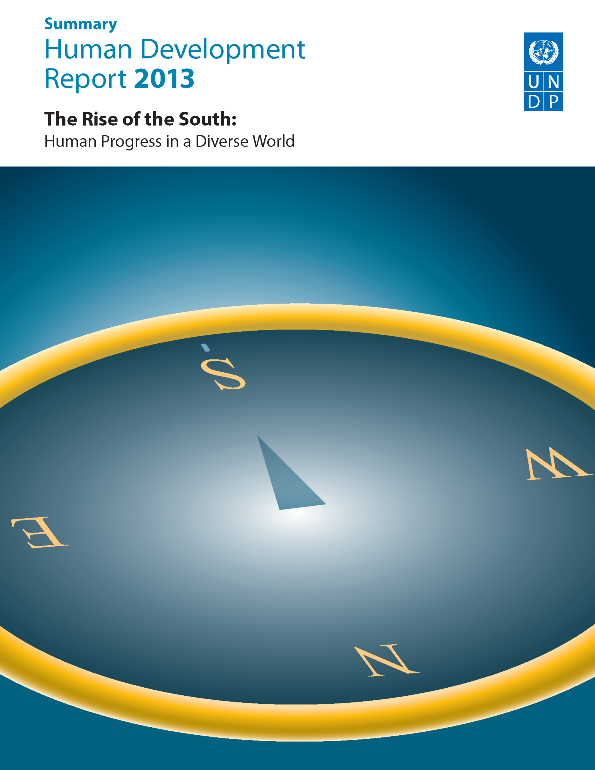 The 2013 Human Development Report—The Rise of the South: Human Progress in a Diverse World—is being launched in Mexico City today by UNDP Administrator Helen Clark and Mexican President Enrique Peña Nieto. The Report analyses more than 40 developing countries that have made rapid human development gains in recent years through sustained investment in education, health and other social services, and strategic engagement with the world economy. The 2013 Report’s Statistical Annex also includes two experimental indices, the Multidimensional Poverty Index (MPI) and the Gender Inequality Index (GII). The GII is designed to measure gender inequalities as revealed by national data on reproductive health, women’s empowerment and labour market participation. The Netherlands, Sweden and Denmark top the GII, with the least gender inequality. The regions with the greatest gender inequality as measured by the GII are sub-Saharan Africa, South Asia and the Arab States. The Multidimensional Poverty Index (MPI) examines factors at the household level that together provide a fuller portrait of poverty than income measurements alone. The MPI is not intended to be used for national rankings, due to significant differences among countries in available household survey data. In the 104 countries covered by the MPI, about 1.56 billion people are estimated to live in multidimensional poverty. The countries with the highest percentages of ‘MPI poor’ are all in Africa: Ethiopia (87%), Liberia (84%), Mozambique (79%) and Sierra Leone (77%). Yet the largest absolute numbers of multidimensionally poor people live in South Asia, including 612 million in India alone. The Statistical Annex also presents data specifically pertinent to the 2013 Report, including expanding trade ties between developing countries, immigration trends, growing global Internet connectivity and public satisfaction with government services, as well as individual quality of life in different countries. Arab States: The region’s average HDI value of 0.652 is fourth out of the six developing country regions analysed in the Report, with Yemen achieving the fastest HDI growth since 2000 (1.66%). The region has the lowest employment-to–population ratio (52.6%), well below the world average of 65.8%. East Asia and the Pacific: The region has an average HDI value of 0.683 and registered annual HDI value growth between 2000 and 2012 of 1.31%, with Timor-Leste leading with 2.71%, followed by Myanmar at 2.23%. The East Asia-Pacific region has the highest employment-to–population ratio (74.5%) in the developing world. Eastern Europe and Central Asia: The average HDI value of 0.771 is the highest of the six developing-country regions. Multi-dimensional poverty is minimal, but it has the second lowest employment-to-population ratio (58.4%) of the six regions. Latin America and the Caribbean: The average HDI value of 0.741 is the second highest of the six regions, surpassed only by Eastern Europe and Central Asia average. Multi-dimensional poverty is relatively low, and overall life satisfaction, as measured by the Gallup World Poll, is 6.5 on a scale from 0 to 10, the highest of any region. South Asia: The average HDI value for the region of 0.558 is the second lowest in the world. Between 2000 and 2012, the region registered annual growth of 1.43% in HDI value, which is the highest of the regions. Afghanistan achieved the fastest growth (3.9%), followed by Pakistan (1.7%) and India (1.5%). Sub-Saharan Africa: The average HDI value of 0.475 is the lowest of any region, but the pace of improvement is rising. Between 2000 and 2012, the region registered average annual growth of 1.34 percent in HDI value, placing it second only to South Asia, with Sierra Leone (3.4%) and Ethiopia (3.1%) achieving the fastest HDI growth.